Want to Get Interviews? Click Here to Submit a NEW Expert Listing. Upgrade 1: Click Here to Get Listed as a "Guest Star"
Want to Raise your Profile? Click Here to Bump it Up. 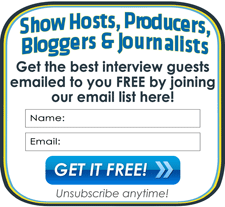 Maximum Publicity: Click Here to Become a "Featured" Guest Star!